There are multiple causes for back pain and because the causes may be due to functional problems rather than structural problems, then MRI is not a sensitive method of establishing a clear cause for the pain. What structures are implicating in causing back pain? There are many different parts of the spine (anatomy) that can be blamed for causing back pain and the pain itself is interpreted and perceived by the brain. Therefore, the way to reduce back pain is either to remove the pain source by diagnosing the cause of the pain, or else reduce the pain perception by means of pain- killing medication. Some pain killers can modify the inflammatory process caused by a spinal structure rather than altering the perception of pain. Most back pain is attributed to variations on a general theme of wear and tear, or “degenerative changes”. Rarely, back pain can be due to issues that require medical attention, including diseases affecting the spine, or diseases causing pain referred to the spine from elsewhere in the body. We can either try and make sense of all the different possible anatomical causes of back pain, which is not particularly accurate. If there were a successful way of diagnosing the causes of all different types of back pain and effectively treat the problem, then the likelihood is that the spinal industry in the Western World would not be as huge, estimated as being over 100 billion dollars a year in the USA and at least 106 million pounds a year in the UK. Although there are occasions when intervention of some form is required to help short-term severe back pain, in the long term, the spine itself requires investment in the form of individualised programs of exercises which promote posture, strength and flexiblity, rather than investment in the spinal industry that depends on people having back pain for its own sustainability. Whilst MRI is usually reserved for those who are suffering with chronic, intrusive back pain, associated with leg pains, the scan provides much more information than simply the state of the discs or nerves. When 80% of the Western World will experience back pain at some point in their lives, this begs the question- why are we so prone to developing back pain? Do we suddenly wear out all our discs? Can surgery or a few sessions of physiotherapy restore our back to full health? There is accumulating evidence to suggest that the way we use our backs results in a slowly developing change in both the shapes of our spines and the gradual development of disc wear, progressing eventually to disc bulges and disc protrusions. 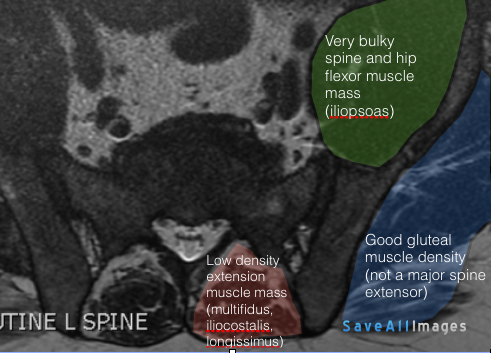 These changes are seen on the vast majority of lumbar spine MRIs, however, the information that we receive is generally condensed to a blanket description of “degenerative changes” or “spondylosis”. I challenge you to get hold of a copy of the actual images that the MRI takes and have a look at the pictures yourself. The probability is that you will find the following image in among all the images on the CD. This is the typical appearance of the muscle imbalance at the base of the spine (L5/S1 region, or lumbosacral junction). The muscles that bend the spine and flex the hips are much bulkier than the relatively neglected muscles which extend the spine in the same area. This suggests that there is an imbalance in this region, which results in the disc at the same level being subjected to excessive eccentric loading and early failure. The direction of failure will be backwards, so any disc bulging will tend to interfere with the spinal nerves which run directly behind the discs. Over ten years ago, a trial was conducted to see whether intensive and specific spinal exercises under supervision was as effective at relieving chronic mechanical low back pain as a surgical spinal fusion. The answer was “yes”, meaning that it was cost-effective and far less painful to undergo a functional restoration programme. This list is not exclusive and the probability of having a serious medical problem due to having a red flag is actually quite low. Even so, medical professionals tend to take red flag symptoms seriously and instigate further investigation such as MRI. Following on from the accumulating evidence which supports exercise as a therapeutic strategy for reducing pain, the advice given by NHS England is centred on keeping going, carrying on and avoiding rest. The site also gives overviews of different causes of back pain. The National Institute of Clinical Excellence (NICE) published its online advice in 2009, in relation to short-term back pain without worrying features which may indicate serious causes. The guidance does not explain how to exclude the potentially-serious causes of back pain. For short-term pain lasting less than 12 weeks, it’s worth reading the NICE advice. This online guide is a useful tool to refer to when accessing the NHS for advice about your lower back pain. It gives guidance on who should assess the back pain, when further investigations may be required and how quickly they should be obtained. The booklet also cites evidence in relation to general treatment depending on the duration of the back pain. This organisation, based in New Zealand, was established to help spread the word, when Robin Mc Kenzie, a physiotherapist, accidentally discovered that relaxing the spine in extension can provide marked improvement in back pain almost immediately. Sounds too good to be true, right? Most back pain is due to how we use our backs on a day to day basis and, unfortunately, over the years, we unintentionally develop stronger muscles that flex our spines and ignore the muscles that extend our spines. Robin McKenzie originally published his observations and opinions in his book “Treat your own back” and went on to write successful self-help books for neck pain and other painful joints. The McKenzie institute aims to popularise his exercises. An interesting potted history and videos of Mr Mc Kenzie are on the link below. Sadly, he passed away in 2013, but he leaves an impressive legacy with his spinal work.